So Okay... We're certified organic farmers... But that's not so remarkable. Organic farmers are a dime a dozen. Wal-Mart even has all the right labels: organic, grass-fed, antibiotic-free, hormone-free, GMO-free, free-range, cage-free and you name it. So what do we have that's different? Good question. I hope you have a lot of time to read because I've got a lot to tell you! None of these differences are required by law. We do all of them voluntarily because we know it's best for our animals, best for our land and best for you. It's like I tell the family many times. This is not about The Law... it's about The Love. 1. Soy-Free: 100% of our animals are soy-free. The hens, the meat chickens, the woodland pigs, the dairy milk goats, the dairy cows, the grass-fed beef, and the pastured turkeys... ALL are soy-free. If you get it from The Family Cow, it will be soy-free. It's a commitment we made years ago. 2. Daily Moves to New Grass: We almost hesitate to even use the word 'pastured' to describe our farming practices because that word has been so hijacked by USDA organic confinement chicken corporations with 30,000 birds in one big warehouse-style building, and USDA organic dairy confinement corporations with 15,000 cows on one farm. To them, 'pastured' means a dirt lot or a concrete porch on the side of the warehouse even if the chickens or cows rarely go outside. These are the sources for the cheap 'pastured' organics of the grocery stores. When we say 'pastured', we mean the real thing (Daily Moved to New Pasture). It's the kind of pasture that has real benefit to the Omega 3 and CLA levels of the meat. It's the kind of pasture that you can actually taste and see in the yellow of the butter, the milk and the ghee and even the fat in the poultry. Our hens are totally outside running and catching bugs in our certified organic pastures. We move their wheeled egg mobiles to new grass every day. The turkeys, the same way, get moved to new grass every day. We actually move the meat chickens to new grass two times per day. Our cows get moved to new grass twice a day too. And when the grass is not growing during the winter, we move stored grasses to them twice a day plus let them out to romp and relax in the pasture each day even though there is not grass there for them to eat. 3. 100% Zero Grain Grass-Fed Dairy: This was a hard one to attain. Zero grain beef are fairly easy. Zero grain dairy cows are much more difficult because a cow making milk has much higher daily caloric requirements. In order to do zero grain dairy, the grass quality in the pastures and also the stored winter grasses must be super high, nutrient dense and very high brix quality. The zero grain is important to the end customer because it is how the super healthy Omega 3 and high CLA fats are made. It also makes the best artisan cheeses. This step is difficult enough that very few organic dairy farms even try to be zero grain. 4. Everything Raw: Well okay... not everything is raw because the FDA gets in the way of our true north. But we do truly sell everything raw that we can legally do raw. Raw is so much more immune building and easy on the gut. It's just the way God made it. We cut our teeth on our super special raw organic jersey cow milk over 10 years ago (hence the name The Family Cow). 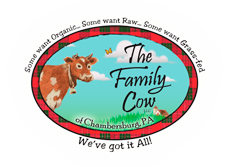 Since that time we have added to it raw goat milk, raw cheeses of all kinds, raw milk kefir grains, raw kombucha SCOBYs, our wildly popular raw water kefir by the Kefir Chicks of Greensburg PA, raw holistic wildflower honey, along with raw sauerkraut, raw kimchi and more. 5. We have Our Own On-Farm Raw Milk Laboratory: Yes! To ensure your safety, we actually lab test every single lot of raw milk before it leaves our farm. It was my wife's idea. So the credit goes to her. Her idea and passion was that we should test every single time we bottled milk and hold that milk back 24 hrs until the test results could lab verify that our Family Cow raw milk is indeed super clean. So we acted upon her idea. We researched and trained with state certified lab technicians and pioneered our own raw milk food safety laboratory. As far as we know, we were the first in the nation to go to this level of food safety. Since that time we have mentored dozens of other raw milk farmers around the world to do the same. That was 6 years ago and we still totally love the astounding level of safety that our laboratory brings... and the moms who trust our raw milk for their families totally love it too! For more details on our lab testing, and for test results history, see this page. 6. We are RAWMI Listed! Raw Milk Institute is a high energy, high integrity group of raw milk farmers, veterinarians and food safety experts from around the world. RAWMI is the brainchild of Mark McAfee, our personal raw milk mentor from Organic Pastures Dairy in California. The vision of RAWMI is to have experienced and professional raw milk farmers around the world helping other farmers to the same level and standards of excellence. All farms which pass the RAWMI standards and the peer to peer inspection must have a written food safety plan called a Risk Analysis Management Plan, written Standard Sanitary Operating Procedures and written Critical Control Points. In 2013, The Family Cow was the 5th raw milk dairy to pass and be listed by RAWMI. To understand the intensity of this food safety achievement, feel free to read through our raw milk food safety plans below. 7. A2/A2 Beta Casein Breeding and Testing: When we started our organic farming journey in 2006, our first step was to sell our big, black and white Holstein cows. We replaced our Holsteins with little, brown Jerseys since they naturally produce mostly A2 milk. We didn't test to verify that our Jersey cows were all A2. But we do DNA test 100% of our breeding bulls and use only those that test pure A2/A2, so by that we know our herd has a fairly high percentage of pure A2 genetics and getting purer with each generation. That seems to line up with what our tribe of raw milk drinkers tells us. Folks that are sensitive to A1 beta casein often tell us that they can drink Family Cow raw milk with no problem. As we speak, we are in the process of DNA testing all of our milk cows for the A2 gene. We'll remove any that are still not pure A2 from our herd. Our herd is a high percentage of pure A2 now and we are working towards a verified pure A2 herd. 8. Our Animals are all USA Grown: We find it shocking that some expensive home delivery services with really nice websites touting ethically sourced, 100% grass-fed beef are selling beef imported from as far away as Australia, Argentina, Chile and New Zealand. The worse thing is that the only way a customer would know this is to email customer support and ask direct, pointed questions. Even that goes difficult. We have tried it. Their websites are usually strangely silent about exactly which country their beef comes from. Question: If a supposedly ethical, transparent company obscures the country where their 'wonderful' meat is grown... how can we be sure of other things they say? 9. We ARE the Farmers: I know this sounds a little ridiculous, like... of course you are the farmers. I hope you are the farmers! Who else would you be? Well, let's just say it this way... the demand for straight-from-the-farmer, grass-fed, heritage raised meats is attracting an awful lot of venture capital investor types who, with a slick looking website and some farmerish jargon and pair of bib overalls are impersonating farmers. That's not us. We are the real thing. No impersonating. Check out our photo gallery. The photos are all real... taken by our family, on our farms. No smoke and mirrors. We promise. Come visit us to see for yourself. See our open door policy. It seems pretty basic, but if you really want to support farmers and really have your food choices make a difference... first things first: better make sure your farmer is a farmer. How do I get these farmer foods? If you live close... this is the best way. You get the best prices, best selection and most attention from the farmers. :) Not only that... you get to visit the farm. Our address is: 3854 Olde Scotland Road, Chambersburg, PA, 17202. Open every day 8:30 to 4:00 PM except Sundays and National Holidays. If you're from PA or a nearby state, you may be able to use one of our drop points. You'll order online. We'll pack your order in ice and deliver it to a community parking lot. You can really know your farmer, shake his hand and ask him hard questions. Connecting with those who grow your food doesn't get much better! Learn more about drop delivery. Yes! Straight to your doorstep! This is our newest option and is by far the most convenient. It's the perfect answer for those out of state and outside our drop point area. But it's also an exciting flex option for moms on those crazy, hectic weeks when running to the drop point is just totally out of the question. Yes, we know those weeks happen!